Once in a while, I choose one of my stash for a special occasion, such as a weekend conference or writing retreat. Or I go buy a brand new notebook (using a very sophisticated and complicated algorithm to verify merit and rationalize need). But in the humdrum of daily writing, I rarely use one of my beautiful notebooks for my messy brain dumping, the equivalent of party shoes in a sandbox. No, no, no. There are old envelopes for that. Posties that float out of magazines. College-ruled spiral-bound three-subject notebooks from universities I've never attended. Napkins. 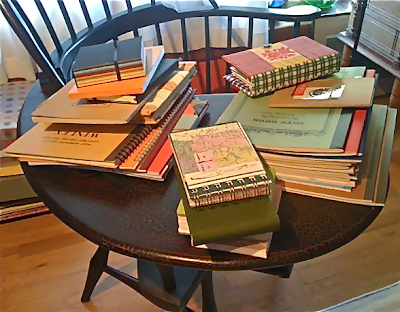 Here you can see some examples from my notebook hoard collection piled up on my writing-arm chair. I recently participated in a March Madness poetry tournament sponsored by Think Kid, Think! Participants were assigned a random, arbitrary, and sometimes impossible word to work into an 8-line poem. My first-round word was "dilapidated." 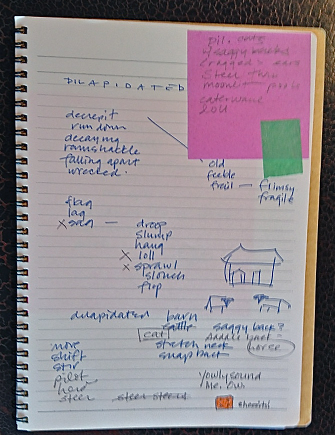 I went to my trusty Thesaurus to excavate down through layers of meaning that would inspire something inspired within the limited time frame, as shown on this notebook page. And here is the resulting poem, which went from barn to cattle to horse to cat as its broken-down subject and requited approximately 1/4 box of Cheez-its per stanza. To gather in back alleys. That come from fish (they wish). 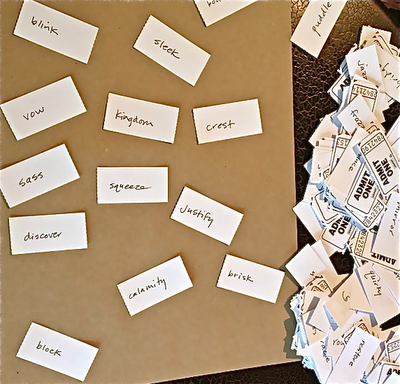 Building a poem from a single word or a small cluster of words is not a bad beginning, actually, and it can be the perfect jumpstart for a writing group or a workshop. I often start a warm-up with an alphabetical word list to see if any combinations or images start to stick to the brain pan. I also like to work with word tickets, which are simply favorite words jotted onto black stubs. If you are setting out to make a set, include jazzy adjectives, vivid verbs, and plenty of homonyms and homographs. The only rule is NO RULES, unless you insist on making some up. Depending on your mood, you can choose a number of tickets and see where they take you, choose a certain number (5 or so) and incorporate all of them into one poem, or combine word tickets with some other prompt (poetic form, ekphrastic, theme, and so on). Then just grab yourself a napkin and have at it! Suz Blackaby has worked in educational publishing for over 30 years. 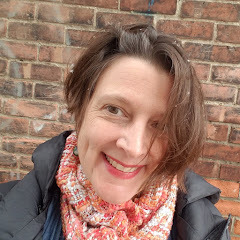 On the clock, she hones her skills writing fiction and nonfiction titles for the K-8 audience, focusing primarily on struggling and emergent readers. 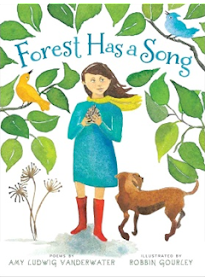 On her own time, she writes poetry, picture books, and middle-grade fiction and nonfiction. 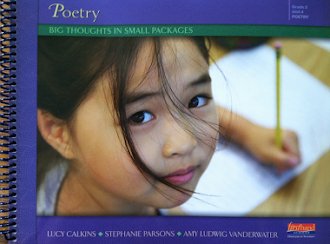 Her collection of poetry entitled NEST, NOOK, AND CRANNY (Charlesbridge, 2010 was included on the New York Public Library's 100 Titles for Reading and Sharing and received The 2011 Liona nd the Unicorn Award for Excellence in North American Poetry. Suz lives in Portland, Oregon, with her family in a lab-mandatory neighborhood. Suz has generously donated a copy of NEST, NOOK, and CRANNY to a reader of this post. Please just leave a comment on this post before late night Thursday, April 26. The winner will be announced on Friday! Congratulations to the winners of the Rebecca Kai Dotlich books! Lori Faas won BELLA and BEAN, and Renee LaTulippe won LEMONADE SUN! Please just send me an e-mail with your name and snail mail address to my e-mail at amy at amylv dot com. I won a book??? Thrilling!!!! I have never won anything - thank you so very much! Suz's post was so amusing, and so much to love: the words on the tickets, that fabulous writing chair, the scattered notes. I write a lot of stories and poems for early readers with a limited vocabulary list, so I work from one word all the time -- and you know, I find it very freeing. Amy, I hope you do the hike again -- I'm in! Oh Renee, congratulations on being a winner! But you are already a winner. I feel I know you by reading your poems, comments on MMPoetry and also your intros to the video poets and poems on No Water River! I agree with everything you said. I love that chair!! And I am similar in the notebook department. Suz, I think your poem was wonderful. I am guessing I voted for it being partial to cats and all. And dilapidated is one of the words of the day I have used in my 3rd grade classroom for our writing. Next year I am hoping I 1) have a blog going by then and 2)will make the time to join in to do something special like Amy's hike. I LOVE seeing writer's notebooks. I can't wait to tell all of my friends and other teachers about Amy's two wonderful sites. And No Water River, too. I feel like I am among the most generous of friends here in the blogosphere. You know, all through that little contest Suz's entries were above and beyond, and in the end, she was still the winner I would have chosen. You'll love NEST, NOOK & CRANNY not only for the reading enjoyment, but also because you'll learn a ton about poetry without even trying. Check out her other books, too. What a smart, diverse writer. How is it exactly, that you can be so clever, poetic and humorous both on the page and in person, Suz?! 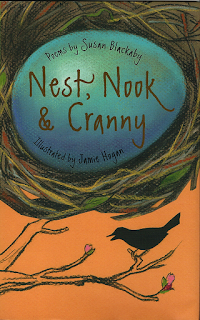 Your Nest, Nook and Cranny book made for an excellent end-of-year teacher gift last year, and I think it will need to be the selection for this year's teacher, too! Thank you for sharing your words (and notebooks) with us all! I remember your poem-wonderful! My daughter has quite a few feral cat friends so I immediately sent the poem to her knowing she would understand perfectly. Thank you for that so right description. And, being a teacher, I have been given quite a few beautiful journals through the years, but I also pick up a new one now & then, for variety, right? I do use a composition notebook pretty regularly, and it is full of sticky notes with ideas, etc. I've jotted in the car. 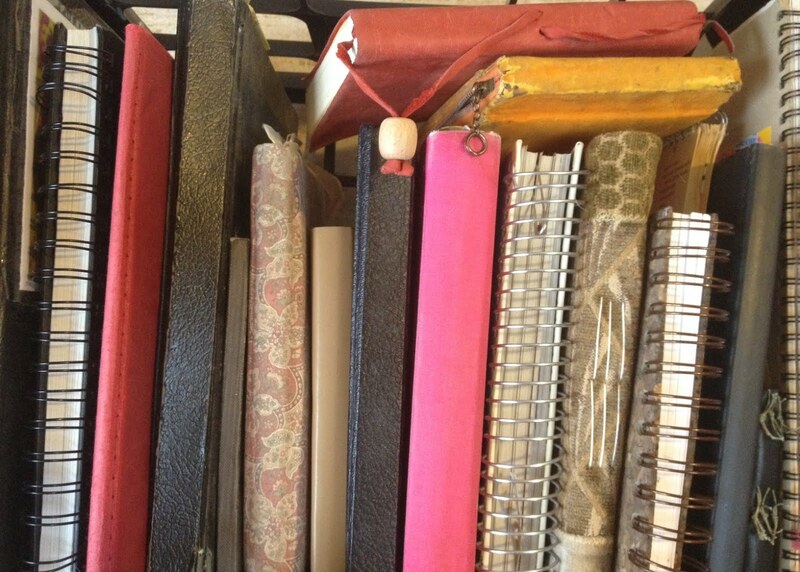 Love the pic of your vast array of journals! And your great sense of humor with your writing. If one must have hoards of anything, I think notebooks are a great choice. :) I would love to read Suz's Nest, Nook and Cranny. I love the behind the scenes look at one of the MMpoems... and I love Suz's handwriting! My notebooks are scribble, scratch and scrawl. Must improve.